Coming from Australia, Hansel is, in the own words, 'five dudes bound by an oath of rock 'n' roll.' Their 'Mission To Rock' comes straight from the melodic glam rock gods that still haunt the whiskey stained gutters of Sunset Boulevard, LA. We're not talking the skinny ties, stupid hats, and new wave nausea of Crowded House or Men At Work. No, Hansel is rowdy, party all night, big hair, and even bigger bulges in the spandex sleaze rock. Or is it all a grand illusion? I think maybe not. On this short four song EP, Hansel clearly demonstrates that they know how to craft a song from the era that they love. Generally, all four songs have strong arrangements with the best parts being the strong lead vocals and ripping lead guitar solos. Of the four, I found 'Mission To Rock' and 'Shot Down For Love' more substantial thanks to those qualities, but also more so because of the energy which captures the best of 80's hair rock and metal. 'Wildcat' had great fret work but, overall, proved plodding and a bit corny with wildcat(?) growl at the end. Production is surprisingly better than average for in-house venture which makes listening enjoyable. 'Mission To Rock' is a good start; let's see if they can keep it up in Round Two. Overall, Hansel's four song debut 'Mission To Rock' is a worthy and promising example of melodic hard rock in that great 80's glam/sleaze tradition. With some greater guidance, including some good label representation (probably from the likes of an Escape, Frontiers or similar sympathetic lot), and wider exposure, Hansel's destiny could be as bright as any of their heroes. Well done and very recommended! 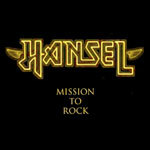 Overall, Hansel's four song debut 'Mission To Rock' is a worthy and promising example of melodic hard rock in that great 80's glam/sleaze tradition.